A few weeks back, I had the opportunity to dine at this new classy spot in town. Mixing art with food, Renoma Cafe Gallery had a really unique theme to it. With the trademark bright red Renoma signage in front of the restaurant, which is located along Jalan Bukit Bintang, just across from Prince Court Medical Centre, I imagined there would be lots of classy Renoma branded clothings inside. "Renoma Café Gallery is a showcase for the philosophy of Maurice Renoma., The Stylist, Designer and Scenographer, always in sync with the latest fashion and design trends, he enrobes this space in his visionary and sometimes scandalous imagery." Arriving at the restaurant during dinner time, it was already dark outside but we were all hyped out to try out the French cuisine here. Being the first Renoma Cafe in Asia outside from France itself, we were treated to a feast for the eyes and the stomach that night. The parking space was a bit limited though, and Renoma Cafe Gallery employ these car jockeys to help park our cars. Serving French cuisine, most of which I could not even pronounce the name, it was indeed a new food experience for me. It wasn't long before the dishes were brought out, and my it was a feast that wonderful night. A feast not unlike what one would have at Renoma Cafe Gallery in France itself! Check the dishes out below. Fancy some lobster soup to kick off the evening? Here at Renoma Cafe Gallery, the Rock Lobster Bisque had a really heavy lobster flavour to it, one which needed some getting used to for those unfamiliar to this cuisine like myself. It was a tad too salty though, but hey new experience for me! Yet another French cuisine which I have yet to taste until that night was the Pan-seared Foie Gras. Served as an appetizer, a heavy one at that, do order this if you're a lover of the Foie Gras. Defined as a pate made from goose liver (marinated in Cognac) and truffles on the world wide web, I had a taste of it for the very first time. Served with compressed grapes, tropical fruit compote and mixed salad, the 120gm Foie Graswill cater for the heaviest eater. Good for the salad lovers who wants to have a dash of delicious salmon on their plate, the Nicoise Salade with Scottish Salmon would do very well to whet anyone's palette for the main courses to come. Served with almon, grilled artichoke, heirloom tomatoes, anchovies, quail eggs and and a robust red wine vinaigrette, it's hard not to like this appetizer. Yet another new appetizer dish for my palette, we were served with the Croque Madame, which was basically grilled ham and cheese sandwich, except it tasted way better than what you would usually get elsewhere. The ones served here at Renoma Cafe Gallery had cured beef, Muscovy duck, turkey ham bathed in melted Gruyere cheese and poached egg crowning seasoned with a shake of black truffles. How exotic is that? Lobster lovers rejoice, as you can enjoy a whole rock lobster tail here. Rock Lobster Thermidor is certainly a fine cuisine. Served with Porcini mushrooms, crustacean veloute and melted Gruyere cheese, it tasted really good. It would have been nicer if I could actually see the lobster on the plate itself, as it was chopped up among the other sauces. Renoma Cafe Gallery's Cod Meuniere had a distinct taste to it, more akin to having butter pan-seared cod with the aroma from kaffir lime leaves and lemongrass. The size was indeed big, but I guess the price does fit the dish, so if you love cod, go for this. Ah, finally a dish I was familiar with, the Oriental Rack of Lamb. I rank this one of my favourite dish of the night, as it was really nicely done, with enough juiciness and oil to melt my stomach's heart. Char-grilled to near perfection, I could not get enough of the lamb. Beef cheek that had been braised and slow cooked for a good 8 hours, and you have the Boeuf Bourguignon. I fancy my beef tender, but not too soft, but if you're one who loves really soft braised beef, then you'll love this dish. Served with pearl onion confit and potato mousseline, the beef meat literally melts in your mouth. I've always loved a good piece of nicely done Wagyu steak, and here at Renoma Cafe Gallery, they do serve some really nice Ribeye Wagyu (with a marble score of 6). Served on a plate with seasonal vegetables by the side and black truffle pomme puree, you can never go wrong with this dish. Overall it was a great night dining out at Renoma Cafe Gallery. 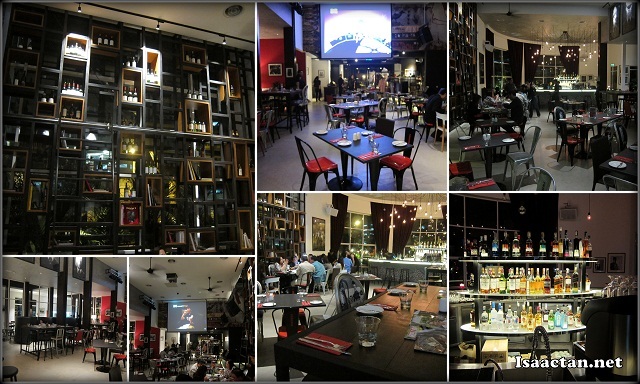 Do check the cafe out if you're in town and in the mood for some French cuisine complete with a great ambiance. You're late! Lots of people posted on this place already, some even twice! Can't forget the name - named after men's underwear!!! LOL!!! Love the place - very artistic, food...dunno! You have to treat me to dinner there and then only can I comment. Hehehehehehe!!!!! Hehe, yup it's a bit costly, but I guess that's because it is a delicacy. It is actually! lol, i expected to see underwears hanging around when I first heard of the place. But it was even better, really artistic spot in town. Renoma reminds me of the clothing brand... :) the food looks really gorgeous.. ! Yes, Renoma brand has always been synonymous with the clothing brand :P ..
OMG looks nice!!!! So tempting, btw haven't try Foie Gras, so wanna try it!! Arghhh!!! I want all the food!! Sibeh kiam siap lah u!!! Not enough friend like that! Tsk! Tsk!